I was on top of the Tour St. Jacques in July!! A friend of mine went there to get tickets and then called me to be there in 50 minutes. The view was gorgeous!!! I would stand in line to see the top of that! What a cool angle in this shot, Eric, really showing off that interesting cloud cover. 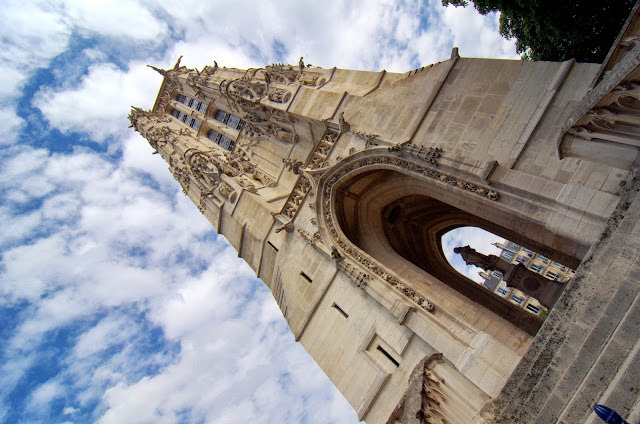 Through Facebook, I let some friends who were in Paris know about the Tour Saint Jacques. One made it to the top! Yes Vreni, the view must be really gorgeous judging from the amazing photos he took. It's fabulous! And I'm sure you'll let us know when you have a chance to go. Excellent photo -- and I'm looking forward to seeing your photos when you get to the top! I don't think make it Ms M... But I may give it a try in September. How romantic... A summit in Paris ! You know how to spoil your followers! Great news, I've always wanted to go up there. First item on next year's list of things to do in Paris. PS Loved your little 'trigger' joke yesterday- was it intentional? Er... no?! What's the joke?